Focus Education is a Data Controller. This means we will ask schools and academies for a main contacts name and some details to allow you to do business with us. This is a B2B relationship in which we are the data controller and the school contact is the data subject. Focus Education has updated this privacy statement in order to demonstrate our firm commitment to the privacy of our customers and visitors to our site, and as a consequence of the changes we’ve made due to GDPR legislation. The following discloses our information gathering and dissemination practices for www.focus-education.co.uk. The European Union Directive on Privacy and Electronic Communications (the “Directive”), which came into force on 31st July 2002, recognises that cookies are a “legitimate and useful tool” for many activities, including verifying the identity of web site users. The Directive makes it compulsory for websites to inform users if cookies are being used, and to provide some information on how cookies are used. We may collect and store the following information from you: name and job title, contact information, including email address and mobile number, dietary information (if you are attending a Focus training course) and demographic information such as postcode. We will not collect any personal data from you we do not need in order to provide and oversee the service we offer. Our site’s registration form requires you to provide us with some contact information (e.g. name and email address). We sometimes use this contact information from the registration form to send you information about our company and our products and services by email, post etc. This contact information is also used to contact you when necessary. If at any time you wish to stop receiving information from Focus Education please contact us and we will update our records accordingly. This site contains links to other sites. Focus Education is not responsible for the privacy practices or the content of such websites. Our site uses a form to help us manage requests. We collect contact information (like email addresses). Contact information is used to respond to enquiries, or get in touch with you when necessary. Our online surveys ask for contact information (like email addresses). We use contact information from our surveys to send information about our company. We run competitions on our site in which we ask for contact information (like email addresses). We use contact information from competitions to send information about our company. Contact information is also used to contact you when necessary. This information is not shared with third parties. This site has security measures in place to protect the loss, misuse and alteration of the information under our control. All instances of unauthorised attempted access to our site are logged and investigated. Where necessary Focus Education will inform law enforcement agencies or other relevant organisations regarding misconduct. Focus Education respects the privacy of email accounts and we store your email addresses just as securely as other information on our site. However, we may use email to keep you up to date with news about products, services and offers that we think may be of interest to you. If you do not want to be kept informed in this way by email, please let us know. You can do this by ticking the relevant box where your email address is stored when you register, or by choosing the unsubscribe option within the email. 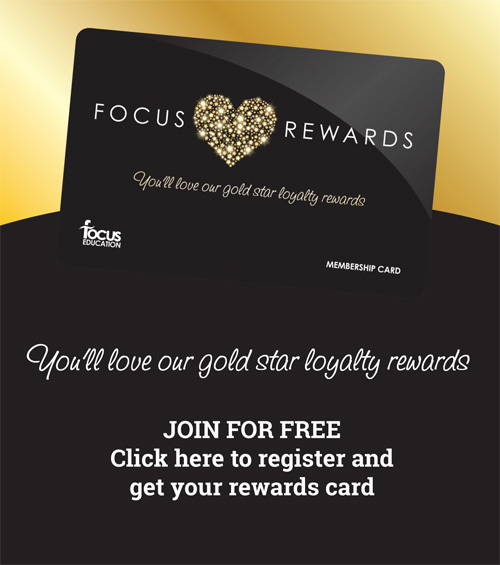 You can also email customerservice@focus-education.co.uk or telephone Customer Services on 01457 821818 and ask to be ‘opted out’ of marketing. Focus Education has implemented the Google Adwords and Google Analytics features. We use the Google Adwords to support Focus Education’s click advertising & remarketing campaign by using key words or phrases which will trigger the Focus Education’s advert to show on search and similar sites. We uses Google Analytics cookies to analyse visitor traffic to the Focus Education website in order to determine how the website was found and what devise the customer was using to view the website. Your personal information is stored on a secure server hosted by a Focus Education approved contractor. The server resides in the United Kingdom. Our site provides you with the opportunity to opt-out of receiving communications from us. You can do this at any point where we request contact information from you. • Send a letter with your name, address asking us to remove you from our database. If you wish to opt out of Google Adwords and / or Google Analytics you can do this by opting out of the use of the Google Adwords and / or Google Analytics cookies, or by clearing the cookies after you have left the website. You may request details of personal information which we hold about you under the Data Protection Act 1998. If you would like a copy of the information held please write to us at the address below. Data will be supplied electronically and in a commonly used format and within one month of receipt of the request. In addition, you have the right to ask us to erase, suspend the processing of or transfer personal data. Send a letter with your name, address asking us to correct or update our database. send your question to us using the relevant on our contact us page; or send your question in a letter. Focus Education will be revising our existing contracts with schools to reflect the requirements of the new legislation. In the event of a data breach Focus Education will follow the Information Commissioner’s Office guidelines. Focus Education do not transfer data to countries outside of the EEA. The cloud providers that we work with guarantee data is only processed in the EEA, or that they explicitly abide by the regulation. The information, graphics and other materials provided on this website are for general information purposes only and are subject to the terms and conditions provided below. Your use of this site acknowledges your acceptance and understanding of these terms and conditions. If you do not agree with them, please do not use this site. Whilst Focus Education and its directors have taken reasonable steps to ensure that the information, graphics and other materials on this website are accurate in all material respects at the time of inclusion, there may be inadvertent and occasional errors or inaccuracies. Focus Education makes no representations or warranties, express or implied, as to the accuracy, adequacy, fairness or completeness of the information, graphics and other materials provided on this website or via hypertext links or any other item used either directly or indirectly from this website and reserves the right to make changes and corrections to such information graphics and other materials at any time, without notice. By accessing this website you agree that Focus Education will not be liable for any inaccuracies or omissions or any direct, special, indirect, incidental, consequential or punitive damages, losses, liabilities, expenses or costs of whatever nature arising from or attributable to anyone having access to or using, or not being able to use, the information, graphics and other materials on this website or any website which is hyperlinked to this website. Other websites which you may have access to through this website are provided to you for convenience only. Focus Education does not make any representations regarding these other websites and accordingly shall not be responsible for the content or use of such websites. All copyright in the information, most graphics and other materials on this website are owned by Focus Education. The reproduction, permanent storage or transmission of the contents of this website is prohibited without the prior written consent of Focus Education. Without liability whatsoever Focus Education may without notice modify and/or discontinue operation of all or parts of this site at any time at its sole discretion, and assumes no responsibility to update the site. Our company is committed to complying with the Disability Discrimination Act and as such, have made many improvements to our website in order to reduce the barriers experienced by people with disabilities. With reference to Government guidelines, our policy is to create pages to W3C Web Content Accessibility Guidelines Priority 2 level. If you do find any of our pages inaccessible, please contact us to let us know (including details of your computer / web browser) and we will make every reasonable effort to restructure the information in a format that you find acceptable. Our approach is one which is diversity positive and we are actively committed to policies and action to ensure that our employees and the people we serve are valued and not discriminated against on the basis of disability, ethnicity, religion, age, sexuality or gender. This has significant business benefits as it improves our performance, provides us access to new markets, enhances our reputation and reduces staff turnover. At Focus Education, we take equal opportunities into account at every stage of the company’s work and we integrate it into our policies on how we recruit and manage staff, deliver our services and work with other organisations. Committed to an approach whereby equality and diversity underpin all the services we deliver for our clients, we ensure that services are accessible in the widest possible sense of the word (including physical and communication) recognising different needs and individual choice.